Each style of interior design and architecture has its own characteristics, which some of us who are more inexperienced in this field may not always be able to detect. These different styles, regardless of the material used to build them, can take on so many different forms. homify has collected 6 wooden houses to show you just how different they can look, even if they are made with the same material. Even though wood is the common thread, each home looks incredibly unique. Remember that wood is a wonderful material for the construction of a home. It has been used for centuries and is still incredibly popular today. Wood has an advantage over concrete in that it is still incredible strong and durable but it is also easy to see if it is need of repair. Concrete, however, is more unpredictable because cracks can be hard to detect and fix. In this article today, we will focus on the facade of the home, examining the different aesthetics and appearances of the houses.You'll easily be able to see – literally and figuratively – how flexible wood is as a material. 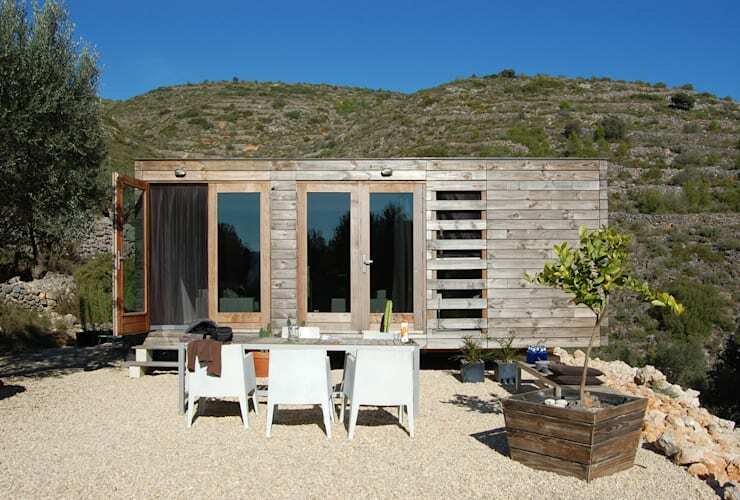 This wooden house is incredibly simple, taking on a minimalist look and feel. This is such a sleek design, that even the roof gutters are hidden. The designers have prioritized the geometric structure of the building. 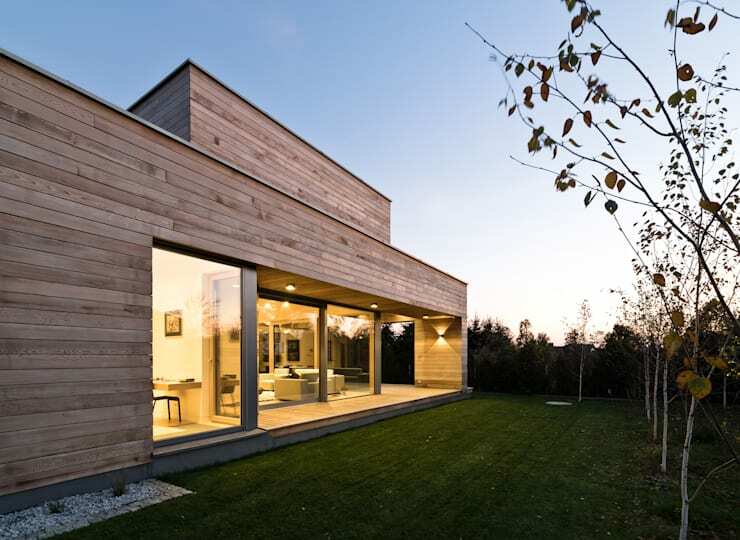 This minimalist house features a wooden facade that is a subtle, natural beige colour. This creates a beautiful presentation that works in harmony with the greenery of the garden. The horizontal wooden plans emphasize the building's simplicity and length. The large windows that extend from floor to ceiling give the impression of space, while connecting the interior and exterior spaces. Designed by architect professionals Smart Wood, this home looks a little like granny's house in the woods, especially with the mountains in the background. The house is built with round logs, which are arranged horizontally. The rustic style creates a very earthy and natural look and feel. The round logs are raw and striking, where the naturalness of the design is enhanced by the imperfections and the uneven combination. The main entrance is also very charming, inviting guests into the home. The only extravagant addition to this home is the smart arrangement of colours, with the white finishes adding a gorgeous touch to the home. This wooden home is incredibly modern and not only because it has a simple design with an economical finish, but also because it is a modular home. This home can be very rapidly put together, because the modular houses usually feature prefabricated structures that are fixed in place. The benefits are countless and include a lower price, a quicker construction rate and a much more environmentally-friendly design. 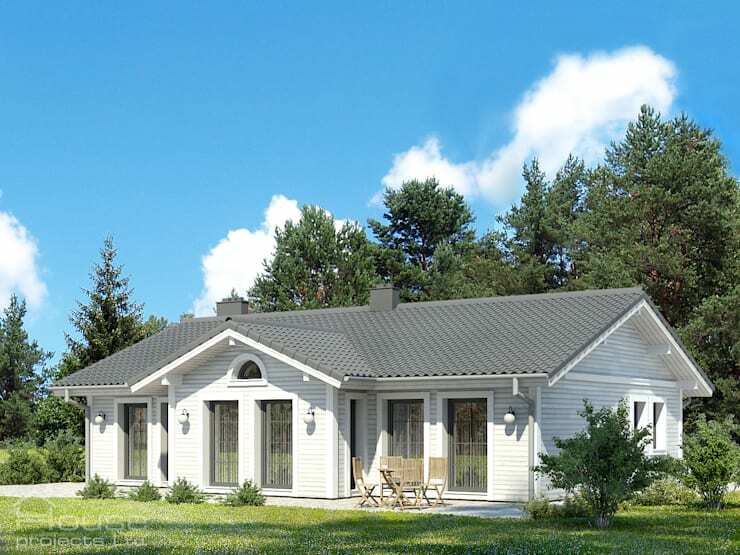 Typically modular homes are minimalist in design, with a huge focus on simplicity. This particular home shows that gorgeous collision of modern and minimalist, where a grey/silver coloured wood creates a beautiful facade. This beautiful and elegant wooden house features a classic style that stands out, not only for its colour but because of its aesthetic appeal. The edges and corners of the building and the windows feature fine, white borders, which create a very neat design. In addition, there is a classic and decorative semi-circular window that is positioned just below the roof peak. This type of house harmonizes beautifully with the surrounding greenery and the clear blue skies. All that is missing is the white picket fence! This wooden house features an Asian style, with strong colours and stark contrasts. 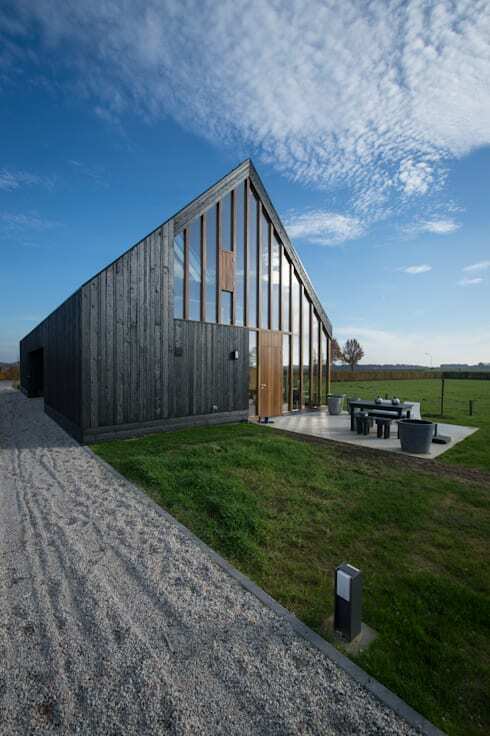 From this angle, we can see how a deep black timber was used as well as how the vertical slats climax in a sharp, pointed roof. The Asian style is very clear but also very economical. This home also takes into account natural light. The designers have glazed all of the windows and have played with the geometric shapes of the glass windows, which cast a very interesting shadow in the interior. 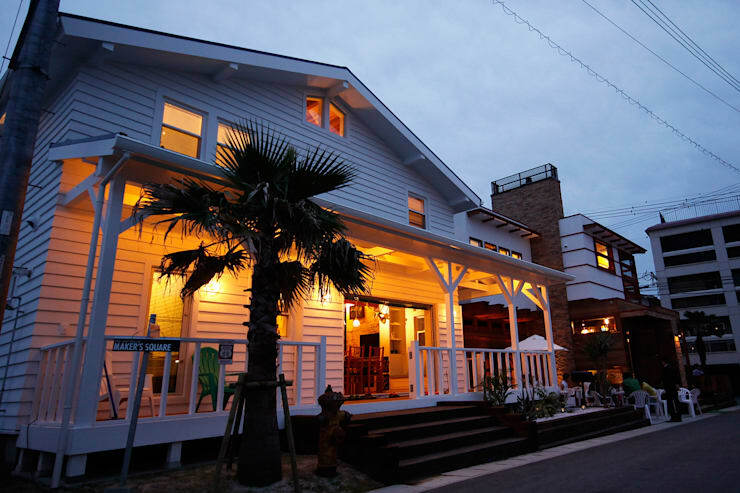 This house stands out because of its very spacious terrace, which is positioned outside the front door. It is sheltered by the upper level of the home. The colour of this house is also very important, enhancing the Colonial style. Do you see how well wood works for this type of home? If you've enjoyed this article, you'll love these 10 wooden homes that will make you yell wow! Would you use wood for your home design?